Much has been written about strategy and planning. When I started to play Chess I dreamed with the “perfect” game: I would play the opening, I would devise a single grand ( enormous, magnificent,unbeatable ) plan and I would carry it out in style. Everybody would congratulate me, asked my advice and the game would find its place in the books. –End of dream. So, strategical thinking cannot be separated from tactical calculation. The key is to prevent all the opponents’ tactical counterplay and then liquidate the position. Apparently and if you have managed to expose your opponent’s weaknesses, this strategy would pay its dividends. Thus: 1) creation of weaknesses ;2) Prevention of counterplay; 3) Transformation of the position. In the process you will have to deal with threats, unexpected moves, your own mistakes and your opponent’s will to beat you . Perhaps this is the secret to success …? Of course not!! In the past I thought most of the glorious ideas I read in books were a sort of absolute truth. But then , when I try to play the game nothing of that happened/ was likely to happen, etc. So my advice is this: Never, never blindly believe what people write in books. Books must be servants, not masters. Refer everything you read to your own experience. The map is never the battleground. Even GMs may be writing by a lot of different reasons, and bear in mind NOBODY , LET ALONE PROFESSIONAL GMs .IS GOING TO REVEAL ANY SECRET. Study good books, and, above all, study good collections of games with good notes. And do your own work. Now look at the following game : it was acclaimed as a rare masterpiece containing a single grand plan which comprises the whole game ! 11…, Nbd7/ 12. 0-0 a5/ 13. Rae1! Re8/ 14. f4! Bxc3/ 15. Qxc3 Ne4/ 16. Nxe4 Qxh4 17. g3 Qe7/ 18. Bg4! Nf6/ 19. Nxf6 Qxf6/ 20. Bxc8 Raxc8/ 21. Rf2 b6/ 22. Re-f1 Qg6/ 23. f5! Qf6/ 24. e4! c6/ 25. dxc6 Rxc6/ 26. a4 Kf8/ 27. Rd1 Re-c8/ 28. b3 Ke7/ 29. Qf3 ( over to the K-side), Kd7/ 30. h4 Kc7/ 31. Kf1 Kb7/ 32. Ke2 R8c7/ 33. Rh2 Qd8/ 34. g4 f6/ 35. Rg2 Rc8/ 36. Rg3 Qd7/ 37. Qd3 Qf7/ 38. Rh1 Rh8/ 39. R1-h3 R6-c8/ 40. g5! hxg5/ 41. hxg5 Qc7 (d6 must be defended) 42. Qd5 Ka7/ 43. Rd3 Rxh3? !/ 44. Rxh3 fxg5/ 45. Rh7 Qe7/ 46. Kf3! Rf8/ 47. Kg4 Rf7/ 48. b4! axb4/ 49. a5! Qb7/ 50. axb6 Kxb6/ 51. Qxd6 Ka7/ 52. Qxe5 b3/ 53. Rh3! Rf6 / 54. Qd4 Rb6 55. Rxb3 , Black resigns. Apart from studying the planning in the game, it is very important to realize how that planning is carried out by means of threats. Chess is a game of threats. The Way They Used to Play. In one of my first books on Karpov -I bought it around 1980- I saw a note by the author pointing out that the plan followed by Karpov had appeared in an earlier game. Nothing to write home about. That was the way they and we worked those days: you had your opening repertoire, try to find GM games with those lines and try to follow the strategical specifications. So that is the key today! No Chess “culture” or something like that: a coach + Any engine and the point is what matters. Perhaps this explain why I find today´s Chess so BORING? ?.- In the past we discussed the different styles of Petrosian and Spassky, Karpov or Fischer, Botvinnik and Tal… Today perhaps they discuss the different styles of Rykka and Houdini !!?? … so ignoring the immense Chess lore accumulated throughout the centuries… Food for thought… The more I read these things, the more I love my dear old Chess books. 1. c4, Nf6/ 2 . Nc3 , g6/ 3. e4, d6/ 4. d4, Bg7/ 5.Be2, 0-0/ 6. Bg5, c5/ 7. d5, e6 / 8. Qd2, exd5/ 9. exd5 ,Re8 / 10. Nf3, Bg4/ 11. 0-0,Nbd7 / 12. h3, Bxf3/ 13. Bxf3, a6/ 14. a4, Qe7/ 15. Rae1, Qf8/ 16. Bd1, Rxe1 /17. Rxe1, Re8/ 18. Rxe8, Qxe8/ 19. Bc2, Nb6/ 20. b3, Nbd7/ 21. Bf4, Qe7/ 22. Qe2, Kf8/ 23. Qxe7, Kxe7 / 24.a5, h5/ 25. Bd2, Ne8/ 26. g3, Bd4/ 27. Kg2, Ng7/ 28. f4, Nf5/ 29. Nd1, Nh6/ 30. Kf3, f5/ 31. Bd3, Kd8/ 32. Ne3, Ke7 33. Nc2, Bb2/ 34. Ke3, Nf6/ 35. Ne1, Bd4 / 36. Kf3, Bb2, 37. Ng2!, Nd7 /38. Nh4, Kf6 /39. Ke3, Nf7 / 40. Bc2, Ba1/ 41. Ke2, Bb2/ 42. Be1, Ba1/ 43. g4!, hxg4/ 44. Nxg6, Kg7/ 46.Nh4, Kf8/ 47. Bf5, Nf6 / 48. Bc8, Nd8/ 49. Nf5, Nh5/ 50. Bd2, Bd4/ 51. Nxd4, Black resigned. 1. d4. Nf6 2. c4, g6/ 3. Nc3, Bg7/ 4. e4, d6/ 5. Be2, 0-0/ 6. Bg5, c5/ 7. d5, e6/ 8. Qd2, exd5/ 9. exd5/ 10. Nf3, Bg4/ 11. 0-0, Nb7/ 12. h3, Bxf3 /13. Bxf3, a6/ 14. a4, Qe7 / 15.Rae1, Qf8/ 16. Bd1, Rxe1/ 17. Rxe1, Re8/ 18. Rxe8, Qxe8/ (The same position as in the previous game. Now White follows the very same plan and beats his opponent. ) /19.Bc4, Qe7/ 20. Qe2, Kf8/ 21. Qxe7, Kxe7/ 22. a5, Ne8/ 23. Bd2, h5/ 24. Kf1, Bd4/ 25. b3, Ng7/ 26. Bc2, Ne8/ 27. Ne2, Bb2/ 28. f3, Ng7/ 29. Kf2,, Bf6/ 30. Nc3, Bd4/ 31. Ke2, f5/ 32. F4, Ne8/ 33. Bd3, Bxc3/ 34. Bxc3, Nef6/ 35. Be1, Kf7/ 36. Ke3, Ke7/ 37. Bc2, Kf7/ 38. b4,cxb4/ 39. Bxb4, Nc5/ 40. Kd4, Nfd7 / 41.Bd1, Ke7/ 42.g4, hxg4/ 43. hxg4, Kf6/ 44. Ke3, b6/45. gxf5, gxf5/ 46. Bxc5,Nxc5/ 47. axb6, a5/ 48. Bc2, Ke7/ 49. Kd2, Kd8/ 50. Bf5, Nc4/ 51. b7, Kc7/ 52. Bc8, Nc5/ 53. f5, Ne4/ 54. Kc2, Kb8/ 55. Kb3, Nd2/ 56. Ka4, Nxc4 / 57.f6,Ne5/ 58. Kxe5 , Black resigned. 1. d4, Nf6/ 2. c4, g6 / 3. Nc3, Bg7/ 4. e4, d6 / 5. Nf3, 0-0/ 6. Be2, c5/ 7. 0-0, Bg4 / 8. d5, Nbd7/ 9. Bg5, a6/ 10. a4, Qc7/ 11. Qd2, Rae8/ 12. h3, Bxf3/ 13. Bxf3, e6/ 14. b3, Kh8/ 15. Be3, Ng8/ 16. Be2, e5/ 17. g4, Qd8/ 18. Kg2, Qh4/ 19. f3, Bh6?! / 20. g5!, Bg7/ 21. Bf2, Qf4, 22. Be3, Qh4/ 23. Qe1!, Qxe1/ 24. Rfxe1, h6/ 25. h4, hxg4? (f6)/ 26. hxg4/ 27. a5! f6/ 28. Reb1!, fxg5/ 29. b4! Nf5/ 30. Bxg5!, Nd4/ 31. bxc5, Nxc5/ 32. Rb6!, Bf6/ 33. Rh1, Kg7/ 34. Bh6, Kg8/ 35. Bxf8, Rxf8/ 36. Rxd6, Kg7/ 37. Bd1, Be7/ 38. Rb6, Bd8/ 39. Rb1, Rf7/ 40. Na4, Nd3/ 41. Nb6, g5/ 42. Nc8, Nc5/ 43. Nd6, Rd7/ 44. Nf5, Nxf5/ 45. exf5, e4/ 46. fe, Nxe4/ 47. Ba4, Re7/ 48. Rbe1!, Nc5/ 49. Rxe7, Bxe7/ 50. Ra1, Kf6/ 52. d6, Nd7/ 53. Rb1, Ke5/ 54. Rd1, Kf4/ 55. Re1, Black resigned. This post will deal with the matter of Chess strategy. Contrary to what happens with tactics, Chess strategy presents many problems. As ever, different authors have different opinions. Moreover there are problems when one considers the overlapping concepts of “Chess strategy” and “positional Chess”. Chess strategy has to do with planning and, in fact, everything that happens on the chessboard. Strategy is related to what is known as positional chess. It cannot be isolated from tactics. Strategy has to do with the plans offered by the actual position that help the player to decide a course of action that has to be confirmed by means of the calculation of variations. In the past, strategy was seen as mainly static. Today, with the new ideas, assessments, etc, it adopts a much more dynamic aspect. It could be stated that while tactics is a very concrete part of Chess, strategy is somewhat the more abstract component of Chess. A Chess game contains many decisions based upon strategical nuances: even the first move contains a strategical idea : 1.e4 is different from 1. Nf3 or 1. g3 or 1.b4. As Black, after 1. d4 1…, Nf6 aims at preventing 2…e4 but 1 …b5/ tries to counter 2. c4. But you already know all this. I will try to avoid too many restricted definitions and hope the reader may have an intuitive idea of the matter. 1. Nf3 d5 2. c4 e6 3. g3 Nf6 4. Bg2 Be7 5. 0-0 0-0 6. d4 c6 7. Nc3 Nbd7 8. b3 b6 9. Ne5 Ne5: 10. de5: Nd7 11. Bb2 Ba6 12. cd5: cd5: 13. Rc1 Rc8 14. Qd4 b5 15. Qa7: Ra8 16. Qe3 Qb8 17. Rfd1 Ra7 18. Nb1 b4 19. Bd4 Ra8 20. Rc2 Bb5 21. f4 Ra6 22. Qc1 Qa8 23. Qb2 Nb8 24. Bf2 Nc6 25. Bf1 Qb7 26. Nd2 Rfa8 27. Nf3 g6 28. Ne1 Bd8 29. Nd3 Bd3: 30. ed3: Bb6 31. d4 Ra5 32. Qc1 Ne7 33. Qd2 Bd1 34. Rdc1 Qa7 35. Ra1 Qb7 36. Kg2 R8a7 37. Be1 Nc6 38. Rac1 Ne7 39. Qb4: Ra2: 40. Qb7: Rc2: 41. Rc2: Rb7: 42. b4 Bb6 43. Bf2 Ra7 44. g4 Kg7 45. Bb5 f5 46. ef6: Kf6: 47. Be8! Kg7 48. Re2 Bc7 49. Re6: Bf4 50. b5 Ng8 51. Ra6 Re7 52. Bc6 Nf6 53. b6 Ne4 54. Be1! Bb8 55. Ra8 , Black resigns. Basically everybody says the opening is the development of forces (pieces). Yes. The development of forces with a straightforward strategical idea: the control of the centre. I say the control, not the occupation because this is on of the main fields of debate between the defenders of the classical approach (occupation) and the hypermodern chessplayers (control + pressure, delaying the occupation). In a sense, the opening establishes the first strategical railway of the game, which may change later or continue unchanged. This means that the election of opening in general + a certain opening variation + a certain opening subvariation etc. is of paramount importance to establish the character of the game. This is why one cannot play say, the English, expecting a hard positional struggle because the real character of the postion will be determined by the variations/subvariations selected. The less attention you pay to this detail, the more surprises you will be in for in your games. I. Lipnitsky wrote that the value of a plan in the opening dependent on how the problems of the centre and the initiative were resolved. Centre and initiative: this is how GMs start to study his/her openings. Determine the possible types of centres that may arise and assess who has the initiative orwho will be better positioned to start creating threats (Chess, at the end of the day, is a game of threats.). We will see how many types of centres can be established. 1. e4 e5 2. Nf3 Nc6 3. Bb5 a6 4. Ba4 Nf6 5. 0-0 Be7 6.Re1 b5 7. Bb3 0-0 8. c3 d6 9. h3 Na5 10. Bc2c5 11. d4 Qc7 12. Nbd2 Bb7 13. d5 (Karpov’s trademark: a typical Pawn configuration has appeared. At you can find it too in many other openings. So you should know how to deal with it.) … Bc8 14. Nf1 Bd7 15. b3 Nb7 16. c4 Rfb8 17. Ne3 Bf8 18. Nf5 Nd8 19. Nh2 Ne8 20. h4 f6 21. h5 Nf7 22. Re3 Ng5 23. Nh4 Qd8 24. Rg3 Nc7 25. N2f3 h6 26. Ng6 a5 27. a4 bc 28. bc Na6 29. Qe2 Ra7 30. Bd2 Rab7 31. Bc3 Nb4 32. Bd1 Na6 33. Nd2 Nb4 34. Re3 Be8 35. Nf1 Qc8 36. Ng3 Bd7 37. Qd2 Nh7 38. Be2 Kf7 39. Qd1 Be7 40. Nf1 Bd8 41. Nh2 Kg8 42 Bg4 Ng5 43 Bd7: Qd7: 44. Nf1 (So far you could replay the game trying to understand every move: why it was done, what the idea of the move was, etc.) 44. … , f5 45. ef: Qf5: 46. Ng3 Qf7 47. Qe2 Bf6 48. Rf1 Qd7 49. f4 ef: 50. Rf4: Bc3: 51. Rc3: Re8 52. Re3 Rbb8 53. Qf2 Nh7 54 Nf5 Re3: 55. Qe3: Nf6 56. Nge7 Kh8 57. Nh6: Re8 58. Nf7 Kh7 59. Re4 Re7: 60. Rc7: Black resigned. 1.- Pawn Centre : When one side has two or more Pawns in the centre and the opponent does not have any. Both sides will try to establish their pieces on squares defended by their Pawns. Here piece play is a must .Flank attacks are ruled out. 4.- Closed Centre : Pawn masses blockading files and cutting off diagonals. The plans involve manoeuvring, flank attacks, attack the centre with f4/f5 or d4/g5 or b4/b5 etc. The case in point is the King’s Indian Defence. 5.- The centre under tension: mobile Pawns in contact. The tension may be resolved at any moment and a new type of centre may appear. Here the course of action involves some “fencing” strategy manoeuvring for a suitable opportunity to turn the centre into another type. Kotov’s “Play Like a Grandmaster”; Pachman’s ” Modern Strategy in Chess”; Gelfer’s “Positional Chess Handbook”; Soltis’ “Pawn Structure Chess” ; Dvoretsky & Yusupov’s “Positional Play”; Lipnitsky “Cuestiones Sobre Teoría Moderna en Ajedrez”; Eingorn’s “Decision-Making at the Chessboard”; Nimzowitsch’s “My System”, “Blockade” and “Chess Praxis”; Karpov & Matzukievich’s “Stellungsbeurtteilung und Plan”; Marovic’s “Dynamic Pawn Play in Chess”; Suetin’s “Plan Like a GM” and “Handbook for Advanced Players”; Abrahams’: “The Chess Mind” ; Watson’s “Secrets of Modern Chess Strategy” . Any book on strategy deals with this matter and offer courses of action. The conclusion is that you should decide what openings you are going to play, study the types of centres/positions they may give birth to and study the plans in accordance to them. We could be writin about all this for weeks, ut as I have included the above-mentioned bibliography, I think you are ready to study on your own. So in the second part of the post I will write about how to evaluate a position and include several other games. 4.d5 ed5 5. cd5 d6 6. Nc3 g6 (in Hypermodern openings the centre is ceded to attack it from the flanks, you know) 7. Bf4 a6 8. a4 (prevents …b5) ,Bg7 9. e4 0-0 10. Be2 Bg4 11. 0-0 Bf3: (another very important matter: the exchange BxN must always be accurately assessed . In the ensuing closed position, Black eliminates White’s Knight because Bishops are worse than Knights) 12. Bf3: Qe7 13. Re1 (Both sides fight for and on the centre, though White should have considered 13. e5) …, Nbd7 14. Qc2?! Ne8 15. Qd2 Nc7 16. Bg5 f6 17. Bh6 Bh6: 18. Qh6: b4 (Black decides to close the Q-side) 19.b3 c4 20. Nd1 f5 (20…. Nd5: /21. e5! This shows how tactics permeates everything and MUST always be taken with the utmost care) 21. Qd2 Ne5 22. Nb2 f4(Playing for blockade to manoeuvre behind the lines to create threats once the Blockade is broken. White ‘s Bishop is deprieved of room to move.) 23. Nd3 h5 24. Be2 Nd3: (The game is taking shape : apart from other pieces, the fight will be one of bad Bishop vs. good Knight) 25. Qd3: Qe5 26. Qh3 Rf7 27. Rad1 Kg7 28. Bc4 a5 29. Qd3 g5 30. f3 (White can’t help but waiting. But in these positions the player with the initiative must avoid closing all the lines. On the contrary: the idea is to create the threat of opening up the position to impose one’s trumps) 30…, Kf6 (This is it: threatening … rg8 and g4) 31. Kf2 Rg8 32.Qb1 g4 33. Qa1 Rfg7 34. Bf1 Qa1: (Exchanging pieces or Queens does not have to imply diminishing or losing momentum when the real action depends on other positional factors) 35. Ra1: Ke5 36. Rad1 Ne8 37. Ke2 Nf6 38.Kd3 c4! 39. bc4 Nd7 40. 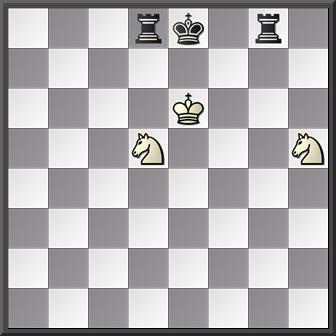 Kc2 Nc5 / White resigned. Paraphrasing Abrahams, apart from losing through making mistakes sometimes -among good chessplayers- defeat comes through trying to do too much or doing too little in the successive positions one finds on the board… Chess is a very difficult game.This is why I love it.